Adrienne Dillard graduated with a bachelor’s degree from Montana State University-Northern and has been an eager student of history for most of her life. Cor Rotto: A Novel of Catherine Carey, due to be completed in Spring 2014, is her first novel. The scene from which this excerpt was taken centers on Catherine Carey Knollys, daughter to Mary Boleyn. In November 1539 she is sent to court to attend on Anne of Cleves. This scene is when she first arrives at court. Before she is able to see any friendly faces, the first person she encounters is someone who has been nothing but maligned in her family so obviously she is a bit distressed by that. However, her first encounter with Jane is not what she expected and she gains a bit of insight into her uncle George. Later, they go on to be confidants and Catherine’s pragmatism plays as a foil to Jane’s need to please those in power even at the cost of her life. We arrived at Whitehall to a joyous celebration. Lively music spilled out of the great hall and most of the windows in the palace were ablaze in torch light. I eased my way out of the carriage, stiff from the biting cold and found my footing. A group of servants rushed over to haul the baggage and trunks out of the cart. Carefully, I picked my way through the mud and headed for the warmth of the palace. 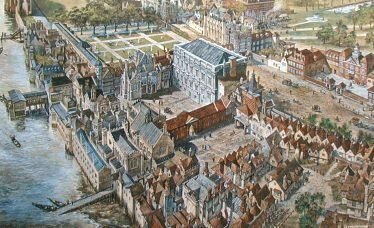 I had never been to Whitehall so I was unsure of my surroundings, but I hoped there would be someone there to guide me to the maid’s dorm. The hall was busy enough, servants hurried by with their arms full, but no one to greet me. I stopped for a moment amid the bustle and listened to the music. If I could let it lead me to the great hall, surely someone could tell me where to go. I walked down the winding corridors, listening intently; as the music got louder, I knew I was close to the celebration. I turned the corner and saw the big doors. They were slightly ajar, so I inched closer to get a peek. The hall was packed, but a space had been cleared to allow for dancing. I had heard that the king loved to see his courtiers dance. His dancing days were coming to an end, but it did not stop him from vicariously living through the young men and women who graced his court. At the center of attention was a couple dancing the volte. The man was lean and muscular, lifting his lithe companion with ease. Vivacious and lively, she threw her head back in excitement, her golden hair cascading down her back. From a distance, it was difficult to tell their age, but the young lady appeared to be of an age as I. I assumed she was to be a maid to the queen. I would have to investigate further. I took in the rest of the scene. The king was sitting under a cloth of estate in all his finery. A purple velvet doublet trimmed in ermine graced his large body. A ring on each finger caught the candle light and glittered. He wore a full beard, still gloriously red. He had aged since the last time I saw him, but I witnessed not a trace of grey hair. He topped off his look with a wide brimmed hat trimmed with a jaunty white feather. Unseen, I could take him all in. I stared unabashedly at his highness. If only I could read his mind. I watched his eyes follow the young lady in the dance, he smiled at her each time she turned his way. He may have a bride on the way, but he was a lusty king after all, it would not be long before she was a favorite, if she was not already. A hand on my shoulder caused me to jump, my heart thudding against my chest. I spun around to see a face I knew well and was not delighted. My late uncle’s wife, Jane Rochford, was staring back at me. I expected a sneer, but I received a smile instead. “Mistress Catherine! I am so happy to have found you. My deepest apologies, I was to meet you at the door, but was detained by a chamber maid. I am relieved you arrived safely,” she said breathlessly. She looked genuinely excited to see me. My feelings for her were of another sort. I actually dreaded seeing her. During George and Anne’s trials, it was rumored that Jane had given evidence against them. At least that was what was whispered in the hushed halls at Hever. I overheard two of our lady maids talking about the shame she had brought on our family. My heart sank at the idea that she was to be a guide for me. How would I ever contain my disgust? Jane left me little time to react. Immediately she was leading me to the maid’s dorm to see that I was settled in and out of my rain soaked garments. She waited patiently on my bed while a lady maid helped me into a dry muslin shift and prepared me for bed. After my long journey I was exhausted and while it was exciting to see the party in the hall, I was in no condition to join it. The lady maid made her departure, my wet clothes in hand, leaving Jane and I to stare awkwardly at each other. I waited for her to break the silence. She looked at me with such hopeful eyes that though my stomach was pitching inside, I knew I could only nod in response. She began to pace the room, her footsteps kicking up the scent of sage in the newly laid rushes. “It is true that I gave evidence against George and Anne, but it is not what it appears to be.” She came to a stop and turned to look me in the eye. “Cromwell had me in a corner and I was terrified of what he might do. I had to ensure my survival. But I never said that Anne and George had a carnal relationship. I never even alluded to the idea, I swear this to you. I could never come up with that abominable scene, that was all Cromwell and the king’s doing. I only repeated that Anne said the king had not the ability at all times to bed her as his wife. Nothing more.” She said earnestly. Her face was flushed and her eyes shone with unshed tears of emotion. “Please forgive me Catherine, I was afraid,” she pleaded. “We were all afraid,” I spat out, feeling the anger rising in my throat. “What makes your fear more important than ours? I gasped. I knew they had been waiting for that moment. George could often be found in front of the fire at Hever gazing at the Ormonde ancestral horn. He turned it over and over in his hands, rubbing his fingers over the smooth ivory, wrapping the silk ribbon in between his fingers. He longed for a son to pass it on to. It had seemed, though, as if it would never happen. My heart filled with love for my uncle George. He was fighting to give his child a chance. I pictured his bright smile, the devilish twinkle in his brown eyes as if he was about to tell some marvelous joke. Suddenly, it occurred to me that a small piece of him could exist. “The baby?” I asked hopefully and held my breath in anticipation. In that moment, my heart broke for Jane and my head filled with rage for the king. Not only did he execute my beloved aunt and uncle, but he caused the death of George’s unborn heir. Jane was just as much a victim as Anne and George. All she had was taken from her and for her reward, she had earned a vile undeserved reputation. I suddenly wanted to be very far from court.